When I was younger I most looked forward to the company who would come celebrate my birthday. And truly the people who come around us in these times of joy and celebration are gifts. 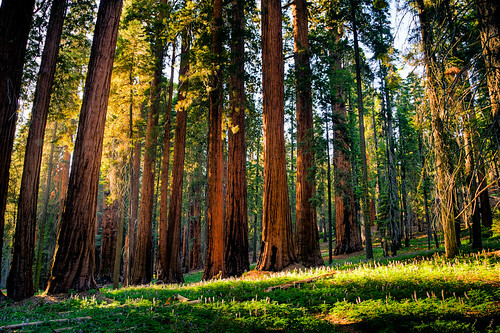 Fittingly, as God always gives, a gift of wisdom and experience and thought came at just the right time wrapped in thoughtful, careful words and packaged in a friend who shared his experience with sequoia trees. He explained how sequoias -- great towering trees that are hundreds of years old and a few hundred feet tall -- best grow their rings, their height, their strength only after forest fires clear out other trees and brush that choke out the small sequoia seedlings. During the fires, hot air rockets up to the tops of the tree canopy, drying the cones allowing them to open and release their seeds. Without the fires, the seedlings don't stand much of a chance of adding more rings to their trunks, of becoming these strong, tall, majestic, mature trees. At 29, I'm learning to be thankful for the first ... and for the intricacies that make up the rings that mark another year of life and everything that made up this ring of 28. The hands of friendship extended. The steadfast love of a husband. Because through these intricacies, God has mercifully drawn me closer to Him, has shown me that his burden is light and His yoke is easy and has held me in His arms. Not how I expected, but, nonetheless, there is another ring of growth marking another year. And I am thankful for them and the ones this year will surely bring, too.